One day I was looking through our current designs and felt like we needed to switch things up a bit. We have antique designs, modern designs, traditional designs, but I still felt like we were missing designs that feature aspects of all our styles. I decided to play a little game of musical chairs with our product images and mix and match designs that I felt would complement each other. What ended up happening?? Really amazing new designs that have a little bit of everything we love in a totally new way. Now you don’t have to choose between modern and vintage, simple and fancy… these designs have it all! A 3 stone ring is a very traditional design typically featuring one large center stone with accenting side stones on a solid shank. One of the shortfalls of a 3 stone ring for many people is that they show too much metal since they typically do not have any pave diamonds. Now available, you can get a 3 stone engagement ring that features less metal and more diamonds with literally diamonds just about everywhere! This ring features our amazing u pave style shank for maximum sparkle and a delicate feel. 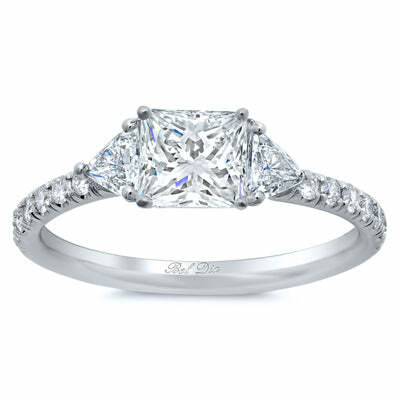 Style HE269 might be one of our most interesting engagement rings yet! This mounting features a combination of u pave and standard pave, hand engraving and antique style milgraining. In other words, if you take the halo of our HE104 mounting and match it to the shank of our HE70… you get this GORGEOUS ring. 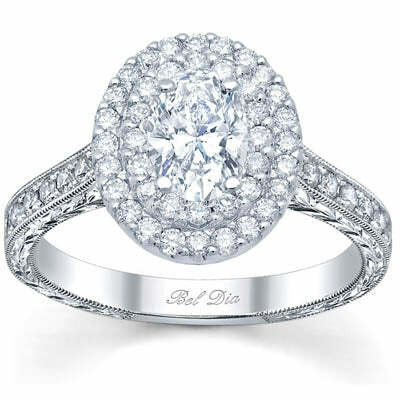 The u pave style used on the halo makes for more sparkle and flush appearance between halo and the center diamond. The more vintage inspired shank featuring regular pave with milgrain gives more structural support to the ring. The hand engraved accents leaves no surface area left untouched, making this ring the embodiment of all wonderful things old and new. Dealing with a smaller diamond but you still want that big ring feel? We have included a double halo to our batch of hybrid designs. This ring is really all about the bling! The halo features our iconic u pave set diamonds for maximum sparkle and flush set design between center diamond and halo. The shank is a more tailored traditional standard pave with a wall for extra support. 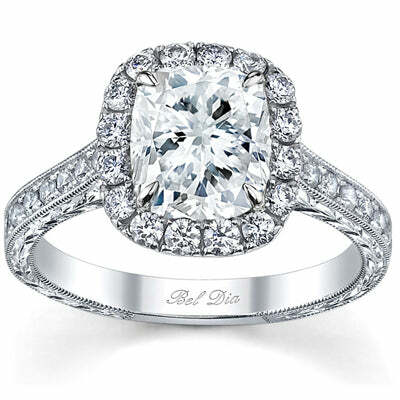 The sides of the ring feature a high polish design for a more classic diamond engagement ring.